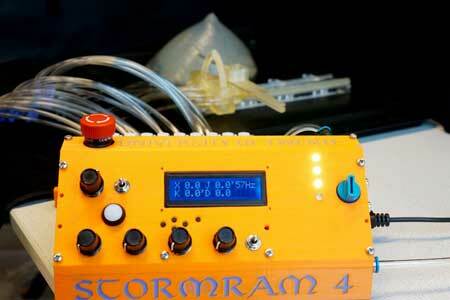 (Nanowerk News) The Stormram 4, as the robot is named, is made from 3D-printed plastic and is driven by air pressure. The advantage of plastic is that the robot can be used in an MRI scanner. Carrying out a biopsy (removing a piece of tissue) during a breast cancer scan in an MRI significantly increases accuracy. The robot won a prestigious award during the Surgical Robotic Challenge at the international Hamlyn Symposium in London: one of the world’s most important events in the field of robotic surgery. The Stormram 4 is a stimulus for the entire diagnostic phase of breast cancer; the accurate needle control, effectively real-time MRI scanning and a single, thin-needle biopsy enable quicker and more accurate diagnoses to be made. Medical robotics is sure to become standard procedure in hospitals in the near future. The Stormram 4 is driven by rectilinear and curved air-pressure motors. The robot is controlled from outside the MRI scanner by means of 5-metre-long air pipes. The design is smaller than the previous version, enabling it to fit inside the MRI scanner’s narrow tunnel. The Stormram 4 is driven by rectilinear and curved air-pressure motors. The robot is controlled from outside the MRI scanner by means of 5-metre-long air pipes. Breast cancer is the most common form of cancer among women. By inserting a needle in the patient’s breast and navigating to the abnormal tissue (lesion), it is possible to take a tissue sample. A good diagnosis is made possible through subsequent clinical analysis; a process known as a biopsy. Accurate navigation of the biopsy needle is of crucial importance in combating breast cancer and other forms of cancer. Through the use of special needles, the tip of which can be very hot (thermal ablation) or very cold (cryoablation), it is possible to destroy tumour cells close to the tip of the needle. This enables the treatment of cancer without the need for invasive surgical procedures. MRI scanners are the answer when it comes to the extremely accurate detection and visualisation of the location of abnormal tissue. 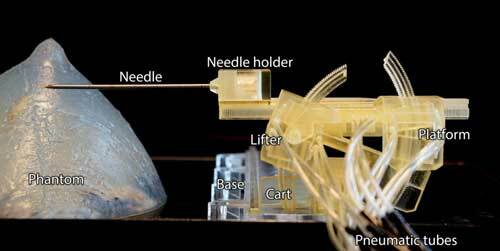 Unfortunately, it is not possible to make full use of this accuracy as long as needles are controlled by hand. Robotics offers the solution. Not all robots can be used in combination with MRI scanners. Robots are often made of metal, a material that cannot be used in the strong magnetic fields of MRI scanners. For this reason, the UT, in collaboration with Ziekenhuis Groep Twente (ZGT), has made the robot entirely of plastic.